Hi friends. Today I’m sharing a holiday card made with some wonderful dies from Cheery Lynn Designs along with some pretty ribbon and silver metallic cording from Really Reasonable Ribbon. I kept things pretty simple on this card since the month of December is so hectic. This card is really just cut and assemble. No inking, no shaping, just cut it out and stick it on! 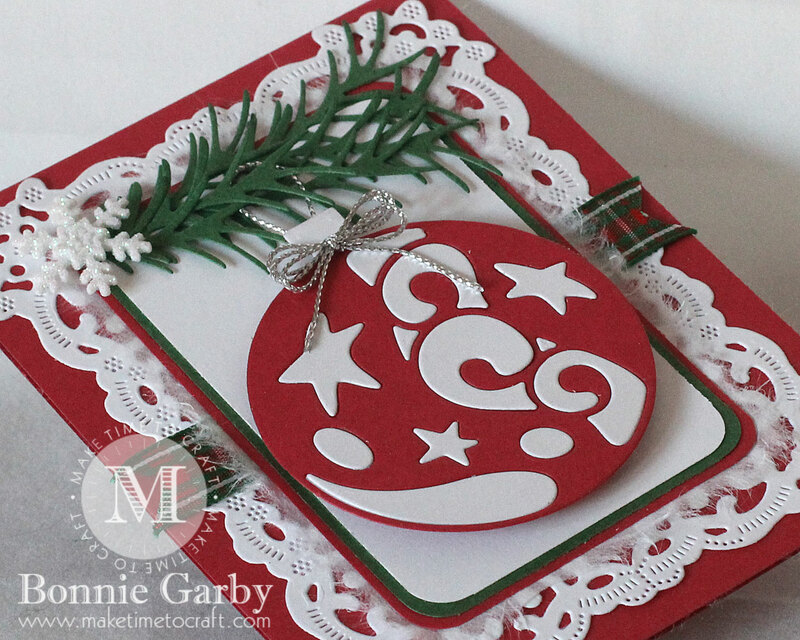 I backed some red and white cardstock with Stick It adhesive and cut the ornament using each color. I cut a circle in red just a touch smaller than the ornament and used that as the base. I then just peeled the backing from the Stick It adhesive and stuck the pieces on. I added the silver cording for the hanger and the bow and the ornament is done! I cut the Fiona’s Magic Mirror die in white and adhered that to my card base. Then I cut a white rectangle measuring 2-1/2″ x 3-3/4″ and then stacked that on a green and red layer leaving a small border on each. I rounded the corners on all the layers. I backed that with white mulberry paper and then added a strip of 5/8″ Christmas Plaid Ribbon from Really Reasonable Ribbon and then added that to the card base. The ornament is added using foam dots for a little dimension. I then cut the Pine Branches and adhered them to the upper left corner. I finished it off with a snowflake embellishment. 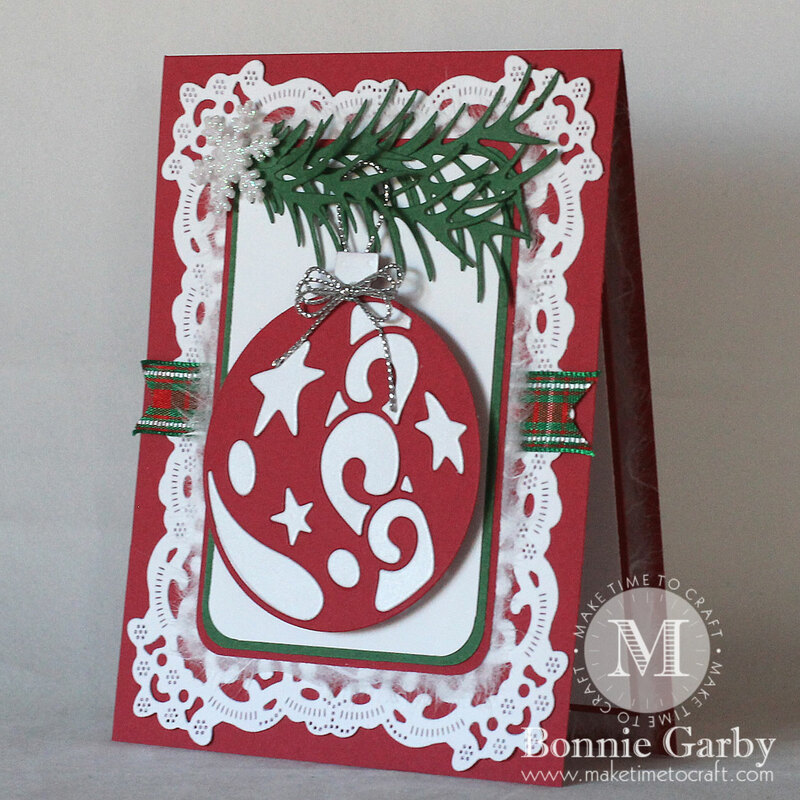 Fabulous card, very striking in red and white with the green branches…love the ornament it looks fantastic! Thanks for joining us at Creative Moments. Looking forward to see you at the next challenge. Check out our DT call on our blog. Simply beautiful Bonnie! Happy Holidays to you & yours!! Thanks so much for joining us at The Sisterhood’s ‘Christmas’ challenge and the Double D ‘Red, White with optional touch of Green’ challenge … please come back again soon! Beautiful card, Bonnie! 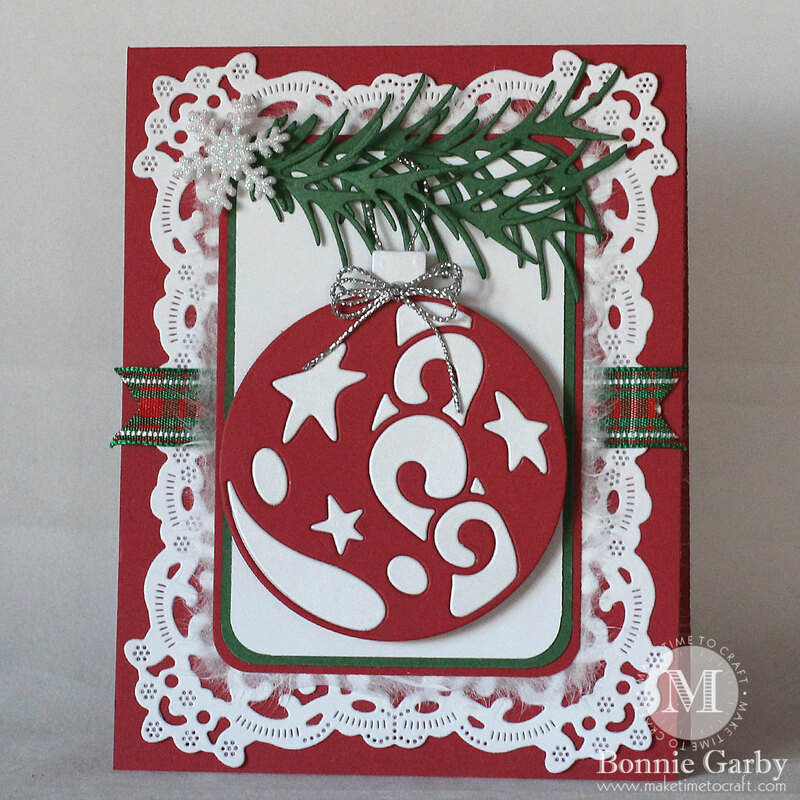 That ornament die cut is gorgeous and looks fabulous in the red and white. Thanks for playing along with our Double D, “Red/White” Challenge! Very pretty. Thanks for joining The Merry Christmas Challenge.